It is my pleasure to be here today for the launching of our new book Ministry of Love: The Story of the Sisters of Charity. 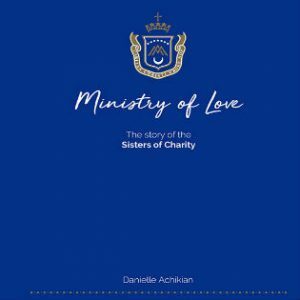 We pay tribute to its author, Danielle Achikian, Sr Suzette Clarke rsc, the Chair of the Committee, and the Committee members Sr Moira O’Sullivan, Sr Genevieve Walsh rsc, and Jennifer Forest, who supported Danielle. The Congregational Leader and Council – Srs Margaret Beirne, Suzette Clark, Cate O’Brien, and me – we feel so proud and yet humbled to launch this book today. As Providence would have it, this is the 180th year of the Sister’s arrival in Australia and this book ensures our story continues. The last photograph in Margaret Donovan’s book, Apostolate of Love, is of a tiny Sr Kathleen Doohan looking heavenwards and being overshadowed by a huge hospital building. The inscription below this striking photograph says Caritas Christi Urget Nos. That book was looking to the future. But who could have known that future as we have it today! Apostolate of Love has been a constant companion to the Congregation and to many of us individually. The worn pages and markings within those pages bear witness to its use. I was one who reached for Apostolate of Love when preparing for special events. When preparing for Incorporation and the formation of Board Members, it was Apostolate of Love we used to tell our story. Then in 2013, we celebrated 175 years in Australia. As Chair of the 175 years celebration Committee I approached our historian Sr Moira O’Sullivan RSC and had a yarn around ‘is this the time to continue our story beyond Apostolate of Love. Moira in her wisdom felt a coffee table book would fit at this time so Moira was commissioned to take on this project which would memorialise the 175 years celebration of the arrival of the Sisters of Charity to Australian soil and serving Australia impelled always by the love of Christ. 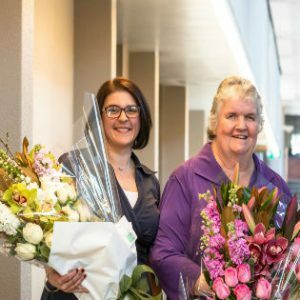 This memorialisation was achieved by a collection of sister’s stories about their current ministries of love, including the expansion of our charism and mission through Mary Aikenhead Ministries (MAM). Its title – Sisters of Charity of Australia 175 years Serving in Australia, Impelled by Christ’s love. Then came, from the Sisters around Chapter time 2014, “What about a book now?” Suzette took up the challenge to carry this forward and contacted Danielle to talk about starting work on a new book. Both Suzette and Danielle had worked on projects before. So, the writing journey began. Danielle spoke to many sisters about it and did a lot of reading and reflecting on the sisters and their ministries. Danielle uses old photos and the final chapter is made up of images capturing the sisters in ministry today. It is surely a work of love and we are excited to be part of it. Before the official words of ‘launching,” love has the final word. Apostolate of Love was a title so aptly chosen and continues now through this new title, Ministry of Love. The word apostolate is from the Greek word “apostello” meaning ‘to send forth.’ Scripturally, the word “ministry” means being charged with the pastoral care of the community. “People must think of us as Christ’s servants, stewards entrusted with the mysteries of God.” (1Cor4:1-2) And what can we say of love? Mary Aikenhead heard Fr Peter Kenny SJ preach on St Paul’s words “The love of Christ urges us” and Mary Aikenhead felt the words to be “divinely energetic”. They were engraved on the seal of the Congregation and are being lived out to this day by its members. God’s love is planted inside all of us. Women of love, sent forth, to live and share the joy of the Gospel with all. On this Patronal Feast Day of the Congregation August 2018 in the 160th year of St Vincent’s College, Potts Point NSW and 180 years of the Sisters of Charity in Australia it now gives me great pleasure, with the Sisters and all who brought the book to this day, to set it on its way: Ministry of Love The Story of the Sisters of Charity, you are now launched! Click on the button above for the launch event. Image 1: Book cover Image 2: The author, Danielle Achikian, with the chair of the book committee, Sr Suzette Clark.